In August, the government unveiled Canada’s Poverty Reduction Strategy. We learned that the federal government is planning to use the Market Basket Measure (MBM) as Canada’s official poverty line. The MBM is insufficient to be considered the poverty line. It’s based on the premise that the cost of a basket of goods and services together represent what an individual or a family needs to respond to their basic needs. It allows someone to reach a “modest standard of living” according to Statistics Canada. But the reality is that anyone living on an income equivalent to the MBM is barely scraping by. By fixing the poverty line to this floor, the Government of Canada is saying that exiting poverty is the same as having one’s basic needs met. This isn’t true. Meeting one’s basic needs isn’t the same as exiting poverty. Instead, it forces a person into a life of constant struggle in which they can barely pay for the essentials. This means that any unexpected cost beyond essentials could put them in a very difficult situation, and have repercussions on their health and wellbeing. That is why the Collectif believes that it is unacceptable for the MBM to become the official poverty line. The MBM doesn’t allow for any of these. 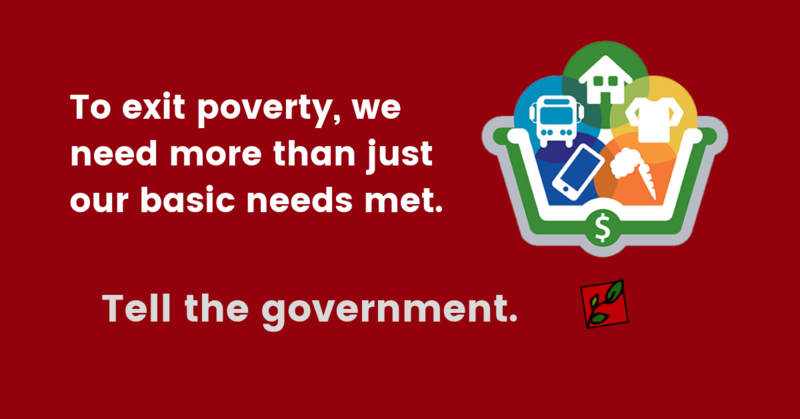 To exit poverty, we need more than just our basic needs met. Click to read more about that campaign! 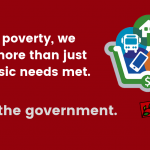 Partager la publication "Let the government know that « covering basic needs » and « exiting poverty » are not the same thing!"